Whereas previous works by Mika Vainio have utilised guitar Life (… It Eats You Up) is the first to use the instrument as its primary sound source. A fascinating, sometimes disturbing and deeply personal work this new 10 track set bears all the hallmarks (exacting attention to detail of tone, rhythm and texture) of Vainio's previous works with some stunning surprises, such as his cover version of The Stooges' 'Open Up and Bleed'. 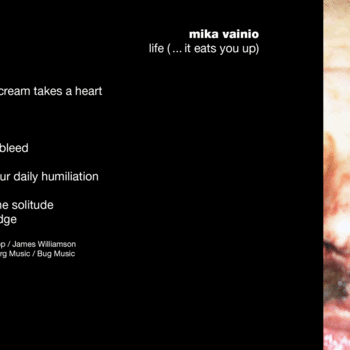 Tracks such as ‘Mining’ hark bark to the banging beat excesses of Pan sonic, with ‘Crashed’ and ‘And Give Us Our Daily Humiliation’ and the opening ‘In Silence A Scream Takes A Heart’ reveal a new intensity to Vainio’s work and is yet another superb additional to his brilliant catalogue.